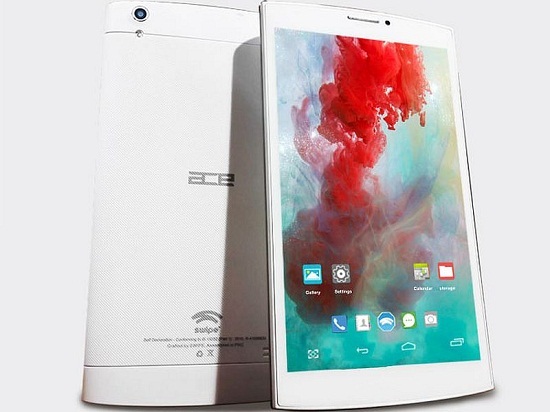 Swipe Technology has launched new tablet dubbed ACE which can be used for Voice calling with 3G support. It will be available at all leading E-commerce website including Amazon, Flipkart and Snapdeal. It had official pricing of Rs. 7,299 but it would be interesting to see variation in its pricing from all major e-commerce websites. Specification features, Android Kitkat v4.4. It has been backed by 1.3 GHz Quadcore CPU with unspecified chipset coupled with 1 GB of RAM. Tablet packs 16 GB of inbuilt storage which can be expanded via. microSD card upto 32 GB. Tablet has got screen size of 6.95-inches with pixel resolution of 1024 * 600. Apart from Voice Calling connectivity includes dual SIM Support, Wi-Fi, Bluetooth, 3G and microUSB. It sports 5 MP rear cameras with Auto LED flash and 2 MP cameras at front. It will be landing the shelves in two classic colors i.e. Black & White. Battery is of 2800 mAh which is rated to deliver 10 hours of voice calling & 96 hours in standby mode. Designing has been the major area which the company has focusing. Swipe touts that it has been designed especially to operate with single hand. Many tablet manufacturing firms had launched Voice calling tablet in past few months. But among those Tablets Micromax Canvas Tab P480 specs. are impressive which can be yours for just Rs. 6,999. Highlight of tablet are Dual Sim Voice calling tablet with 3G support, Dongle support and 1.3 GHz MediaTek Quadcore processor.